If you want to mod the game, it helps to know how to make good-looking graphics for it. Here's the details on the lighting system and colour scheme that you need. There are two purposes to this blog post: one is to explain in detail how the lighting system works in Airships, and the other is to show you how to create graphics for the game that are in the same style as the rest. Graphics in Airships are composed of two parts: the spritesheet and the bump map. 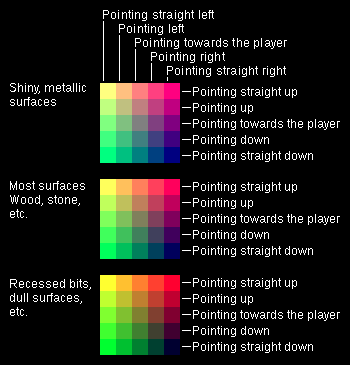 The spritesheet image determines the basic colours of the image, while the bump map determines how they are lit up by light sources in-game. 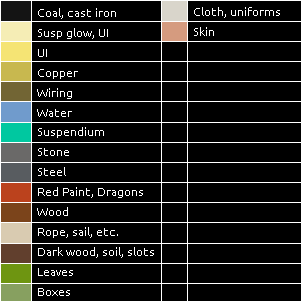 Note that the spritesheet image is literally just a brown square. All the texture in-game comes from the bump map. The bump map stores three pieces of information for each pixel: whether the surface is facing up or down, whether it's facing left or right, and how shiny the surface is. This information is stored in the red, green and blue colour channels of the image. For example, the redder a pixel is, the more strongly it gets lit up by light from above. And they use five values each for the red and green channels. The box is a more bluish colour than the surrounding area, because it's made of metal. Its top is more red, because it's facing upwards, its bottom is less red, its left is more green, and its right is less green. The best way to work with Airships' graphics is to install the GIMP image editor (yes, that's its name) and use the mod graphics template file for it. This lets you easily edit each colour channel of the bump map separately and then combine them. it will break apart into two halves, with the tank going one way and the machine going the other. its panels will fall off independently, the rest of the machine will shatter into bits, and the tank will break in half. Adding fragment maps to your modules will make destroying them look way more awesome, which is why you should do it. I hope this was a useful infodump. Go forth and mod, and feel free to message me with questions!